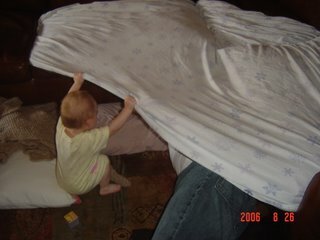 I came out from getting ready to go out to dinner, and Jason had made Kerstyn her 1st play fort. She thought it was the greatest thing she'd ever seen! 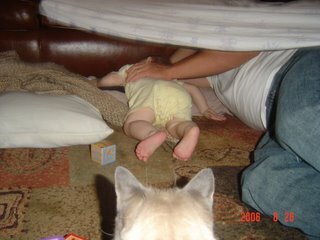 She's started doing this thing where she'll put the pillows on the floor, and lay her head down for a few seconds for a breather or something (as seen in the 1st picture). It's the funniest, and cutest thing! She's just so funny. 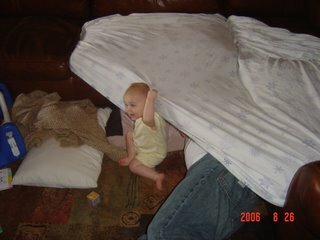 She cracked up when Mr. Blue went under the fort - she just kept laughing so hard - until he left.